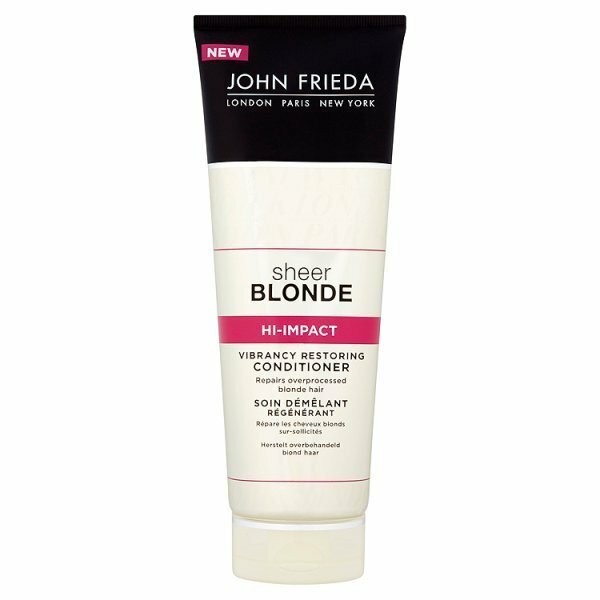 John Frieda Hi-Impact Hair Care Range mends and revives over processed blonde hair, helping you to achieve healthy looking hair. Any blonde will tell you the torture they put their hair through just to achieve their desired shade of blonde. Using bleach, colourants and toners can take its toll on your overall hairs health and then with added heat styling, your hair will be left feeling unloved and swishing for a miracle! The sheer blonde hi-impact hair care range consists of a shampoo, conditioner, deep conditioner and an oil elixir. Each product specifically has its own use and benefit to achieve what it states its going to do for your hair. 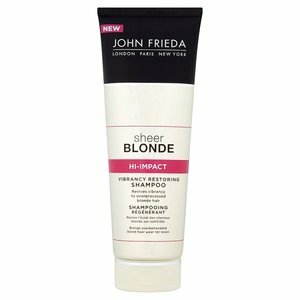 The restoring shampoo restores your blonde hairs healthy vivid hues, whilst also rejuvenating and restoring vibrancy to distressed strands, giving over-processed hair new life. The reviving shampoo has a creamy appearance and texture whilst also being lightly fragranced. Using a small ten piece size amount to work through wet hair the shampoo gently lathers leaving hair cleansed but moisturised. The 250 ml squeezy shampoo tube is great to access all the product and with an added snap shut lid, you can avoid any leakage. The restoring conditioner moisturises while repairing damaged hair to restore vibrancy, great for blonde's! As soon as you run the conditioner through your hair you instantly feel it smooth every hair strand instantly. The conditioner does not feel heavy which is great for the fine hair types and washes out easily, leaving your hair perfectly moisturised. Like the shampoo the conditioner is in the same packaging and is 250ml. HI-IMPACT VIBRANCY RESTORING DEEP CONDITIONER. The deep conditioner repairs distressed strands by intensively nourishing and strengthening whilst also boosting texture and shine to your hair. Applying to wet hair after using the hi-impact shampoo whilst leaving the deep conditioner on for 3-5 minutes before rinsing. The deep conditioner is great to leave on your hair for however long you think your hair might need it. Thicker in consistency than the conditioner but does not feel heavy when applied and rinsed out, your hair feels extremely moisturised and soft like silk. Packaged in a 150ml tub with a twist off lid, you can dispense just how much you want to use. HI-IMPACT VIBRANCY RESTORING OIL ELIXIR. The restoring oil elixir visibly repairs damage and replenishes your hair to bring life to dull strands by reviving over-processed dull hair to reveal shiny, shimmering blonde hair. Apply to damp hair and work through lengths to the tips before blow-drying for an all over brightening. You can also apply the oil to the ends of dried hair to tame frayed tips for an instant smooth style. The 100ml oil is clear in colour and is packaged in a pump bottle that dispenses just the right amount you need. I really like this oil as it instantly smooths misbehaving hair whilst also feeling highly moisturising without being greasy. You could even apply this oil at night for an overnight moisturising treat for your locks. WHY I LOVE THE JOHN FRIEDA HI-IMPACT RANGE. Each product in the range is non-colouring depositing which is safe to be used on natural or colour-treated hair and can be used on Highlights and Lowlights. Conditioner - Repairs & Moisturises. Deep Conditioner - Repairs & Strengthens. Oil Elixir - Mends & Revives. 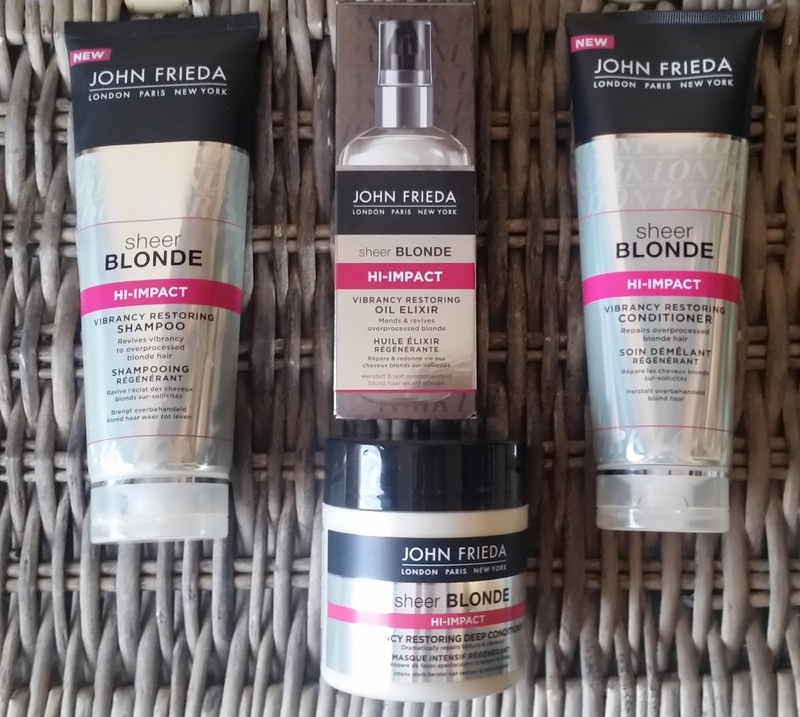 Thank you JOHN FRIEDA for letting us blonde's enjoy our colour with a conscious free mind, swishing healthy vibrant hair. 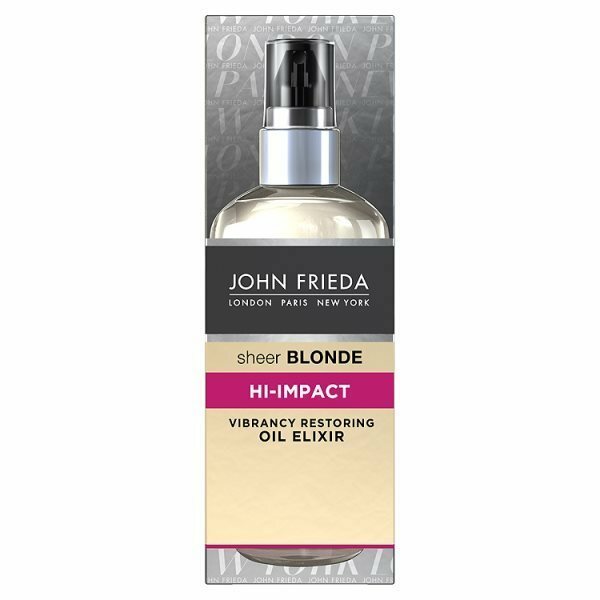 The John Frieda hi-impact range can be found at a store near you or can be found online. X Neil.